I’ve never really reviewed anything before, and definitely not anything to do with beauty. That’s just not me! Even though I have a weird fascination with makeup that no one ever really knows about me. Till I’ve just written about it now. I have weird pigmentation on my lips. I get dark spots, a lot, and at first I thought it was because I lick/chew my lips when I’m nervous/bored/thinking/breathing/living, and that it would go away if I try and stop and just use a shite load of vaseline. It didn’t. I still have a weird lip colour. I’m literally blaming it on my eczema – it’s given me odd pigmentation on my arms, legs and back so I’m just assuming it’s done the same to my lips now. I was told that Vitamin E helps with evening out skin tone and colour, so I researched into Vitamin E lip balms. 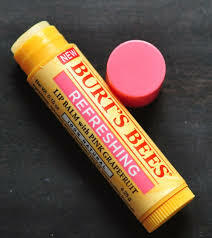 People seem to love Burt’s Bees range of lip products online so I thought I’d give it a try, and went and bought the Pink Grapefruit one as it’s got Vitamin C & E in it. Or so the package says. Also pink grapefruit is yummy. I bought it two days ago. Now, I don’t know about you, but I was under the impression that lipbalms are supposed to hydrate your lips, and not dry them the frick out and make them chapped. My lips just feel dry, they’re chapping and I think they’re starting to peel a bit too. I first noticed this yesterday, so I started to use vaseline at the same time, just to kind of halt the drying/chapping process. My lips feel really sore, and there’s a weird tingly feeling when I put the lipbalm on. Which for some reason I really like. I don’t know why, it just feels like magic is happening on my lips, and I’m always thinking “maybe this is the application that will save my lips and make them less chapped!” and it never is. HOWEVER whenever I go to touch my lips to figure out what the bloody hell is going on and are they still dry, they feel so soft and cushiony and it’s just like wow. So, I guess it does kind of work as a lipbalm. But at the same time, no no no because my lips feel drier than the Sahara right now. Also it smells so good. Like, pink grapefruit (duh) and I’m smelling the grapefruit smell so I guess that’s the same as eating fruit. Screw you, Burt’s Bees! My lips are dry and peeling but they’re so soft and smell so good and I’m just so confused about my lips right now!